With Baltimore police officers in riot gear lining the street, a man stands at the corner of Pennsylvania and North avenues, April 27, 2015. Unrest erupted in Baltimore following the funeral service for Freddie Gray, who died last week while in Baltimore police custody. The funeral of Freddie Gray and the mass peaceful protests that followed his death were eclipsed Monday night by widespread uprisings and standoffs between young people and police in Baltimore. It started on Saturday in Camden Yards, where kids busted police windows, broke glass at a mall and had standoffs with Orioles fans, some of whom chanted at them, “F—k Freddie Gray!” But then things appeared to die down. Things took a more dramatic turn on Monday a few hours after the funeral of Gray, when people burned a police car, smashed windows, threw rocks at officers and looted a CVS. 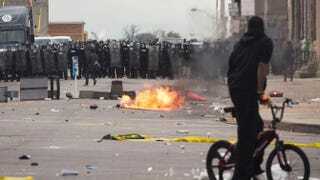 At least 15 officers were injured, 27 people were arrested, and the National Guard and troops were called in. Mayor Stephanie Rawlings-Blake announced a curfew starting Tuesday from 10 p.m. to 5 a.m.
Orioles Chief Operating Officer John Angelos spoke about his outrage, not concerning property being damaged, but the loss of working-class jobs being outsourced and diminishing civil rights protections bent on controlling an unfairly impoverished underclass. But pastors and community activists who have been pounding the pavement all week were working hard to keep the focus on Freddie Gray. “Today, peace. Tomorrow, justice,” beloved Baltimore pastor Frank M. Reid said quietly as he waited for Gray’s casket to be carried out. Reid was talking about a coalition of pastors from Baltimore intent on setting an agenda for the future of the city. But now they were focused on the life of Gray. Over a dozen clergymen from all over Baltimore laid Gray to rest at the New Shiloh Baptist Church. Gray, a West Baltimore citizen whose spinal cord was severed and who slipped into a coma as he rode in a paddy wagon, was 25 years old. Gray was remembered at the funeral by friends and mentors as being a comedian with a gift for imitating voices and as a person who bought neighborhood kids ice cream from the ice cream truck. Clyde Boatwright, a former staff member at his former high school, Carver High School, described him as someone who never caused any trouble the entire time he knew him at school. “Today we are focused on being a blessing to this family. Tomorrow we will meet and come up with an agenda. We have been working together all weekend long,” said Reid, recognizing Gray’s grieving family of sisters, stepfather, mother and father in the audience. Families United for Justice, a group of relatives of black victims of police violence—including the mothers of Amadou Diallo, Ramarley Graham and Kimani Gray; the sister of Shantel Davis; and the niece of Alberta Spruill—traveled from New York to the funeral. If Baltimore has proved nothing else to the world for the past week, it has shown that it is in desperate need of change. There are 16,000 abandoned homes in neglected pockets of the city and a 25 percent unemployment rate. And while downtown development has blossomed for several decades, the majority of the city and the residents live in a kind of poverty normally reserved for underdeveloped countries. “Why can’t the Westside get the same thing that downtown gets?” asked Murphy.